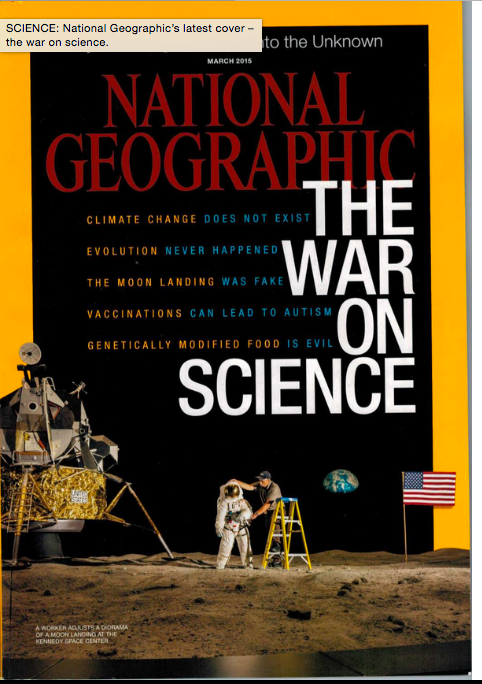 Don’t be fooled by the latest cover of National Geographic and their absurd conflation of climate change (so-called) with the other items they’ve listed on that same cover. No serious person, skeptic or believer, denies that climate changes. In fact, that’s precisely what skeptics have been saying for years: climate by definition is constantly changing, and so how is it, many of us ask, that anyone can say the optimal earth temperatures occurred (roughly) between 1850 and 1980? All of which, however, is slightly beside the point — and one is more than a little disheartened to see that a venerable magazine like National Geographic doesn’t have even the most rudimentary grasp of the issue at hand. Politically, global warming and climate change have little if anything to do with climate science, and the fact that this subject has become such an overwhelming political issue is a fine testament to how poorly the world understands the legitimate functions of government, and why those functions are legitimate. Indeed, it turns out that the whole anthropogenic global warming (AGW) position can be easily defused without any reference to science at all, because the error, at root, is epistemological. The truth about global warming which many don’t want to hear is that it’s become so polarized only because it’s turned political. The essentials of the subject have thereby been swallowed up in an ocean of misinformation, equivocation, and propaganda. Statism is concentrated state authority. The word refers to a government that believes it has legitimate power to any extent over individual rights and freedom of trade. Statism is also called Authoritarianism. Opposition to laissez faire derives in part from ethics, but even more fundamentally from the science of epistemology. Ethically the fundamental political question is this: are humans free by nature? The answer to that depends upon the answer to an even deeper question: why (if at all) are humans free by nature? And the answer to that is epistemologic. The human brain — to address the latter query first — is individuated and rational by nature, and because of this, humans by nature possesses the faculty of choice. And choice presupposes the freedom to choose. This is the locus of the inseparable, indivisible link between reason and rights. Ultimately it is only the individual who can exercise the power of volition, or not. Government bureaus cannot. The state cannot. The collective cannot. Only the individuals who make up these entities. If humans did not possess the faculty of choice, humans would be neither moral nor immoral but amoral, just as animals for this very reason are amoral. But human action is chosen. This, then, is what finally gives rise to the fact of human freedom as an epistemological necessity. It’s also what it means to say that humans are free by nature: we are born with a cognitive faculty that gives us the power of choice: since this faculty is the primary method by which we thrive and keep ourselves alive, we must (therefore) be left free to exercise that faculty — and leave others likewise free. Please note that this is not just some cryptic theory on how human freedom could conceivably be defended: the rights of each individual are demonstrably rooted in our cognitive quiddity – and for this precise reason, human freedom without an accurate and thorough understanding of our epistemologic nature can never be fully understood. Or defended. It is precisely the lack of epistemological grounding that has made rights and therefore human freedom vulnerable throughout all of history. The evolution of the human brain created rights; it happened at the exact moment when this same evolution created a rational animal called a human being – which is to say, when nature created the capacity of free will. Philosophy, then, being the most general science, unifies facts from all disciplines into an indivisible whole. Thus, without proper philosophical underpinnings, scientific facts, no matter how airtight they are, remain unincorporated. It is this point that provides us with the real and final connection between global warming and individual rights: the provenance of rights, including private property rights and the freedom to trade that property, is found ultimately the human being’s freedom of will, and it is only statist politics – also known as coercive government – that can with impunity negate the individual’s natural rights. It does so through force, either directly (as in physical expropriation or imprisonment), or indirectly (as in compulsory taxation or fines). The statist politics that the AGW position explicitly calls for are in this way antithetical to the methods by which the human brain and the human species properly functions and flourishes. But there’s much more to it than this. It must first of all never be forgotten that the philosophy of science is only a species of philosophy proper. Science is the systematic gathering of data through observation and reason. Science is built upon knowledge, and knowledge is built upon reason. Reason derives from the nature of the human mind — which is to say that humans are the rational animal. Epistemology – one of the two main branches of philosophy – is the science of knowledge. Epistemology, therefore, studies the nature of reason. In this way, all science is hierarchically dependent upon epistemology. In the realm of human conviction, there exists at any given time only three primary alternatives: possible, probable, and certain. Possible is when some evidence exists, but not much. Probable is when a lot of evidence exists, but not all. Certain is when the evidence is so overwhelming that no other conclusion is possible. Obviously, then, what constitutes possible, probable, or certain is the amount of evidence and the context of knowledge within which that evidence is found. To conclude certain, or even “over 99 percent certain,” to quote James Hansen of NASA, requires a sufficient knowledge of all relevant data and all potentially relevant data. This is as true in a scientific laboratory as it is in a court of law. It means that nothing – the complexity of clouds, for instance, or aerosols, deep ocean currents, cosmic rays, sun spots, et cetera – nothing is poorly understood, or insufficiently understood. It means that the science has culminated to such a degree that our knowledge of it is complete or near-complete – so much so, at any rate, that there is essentially very little left to learn. It means that because the evidence is so great, the conclusion admits no doubt. It means, moreover, that the data-gathering process is not biased or influenced in any way by anything extracurricular, like activism. Such is the nature of certainty. From an epistemological standpoint, certainty means absolute. And yet it’s many of these same AGW scientists who, today, under the insidious influence of postmodernism, assure us that there are no absolutes in science – “science doesn’t deal in truth, but only likelihood,” to quote another NASA scientist, Gavin Schmidt. Truth is only relative, you see. Quantum physics and thermodynamics have “proven” that the only certainty is that nothing is certain; definitions are purely a question of semantics; a unified philosophy is “circular reasoning” (or, at best, “system-building”); all moral law and all social law is subjective and unprovable. The mind, in short, cannot know anything for certain. Yet AGW is virtually certain. These are all epistemological assertions. Global warming is human-made. Humans are ruled by governments. Therefore, government bureaus, centralized planning committees, and more laws are the only solution. In philosophy, this is called a non-sequitur. The AGW argument is a total non-sequitur. Thank you! That was my own — rather off-the-cuff, but I stand by it.